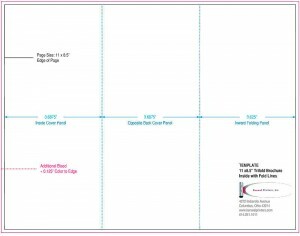 Trifold Brochures | Kenwel Printers, Inc.
A brochure is typically designed in a landscape orientation, that is, the paper’s longest edge falls along the top and bottom of the page. Art and text appears on both sides of the page creating an ‘inside’ and an ‘outside’. The most popular size for a brochure is 11 x 8.5″ but we frequently produce 12 x 9″ brochures, as well as larger and smaller custom sizes. 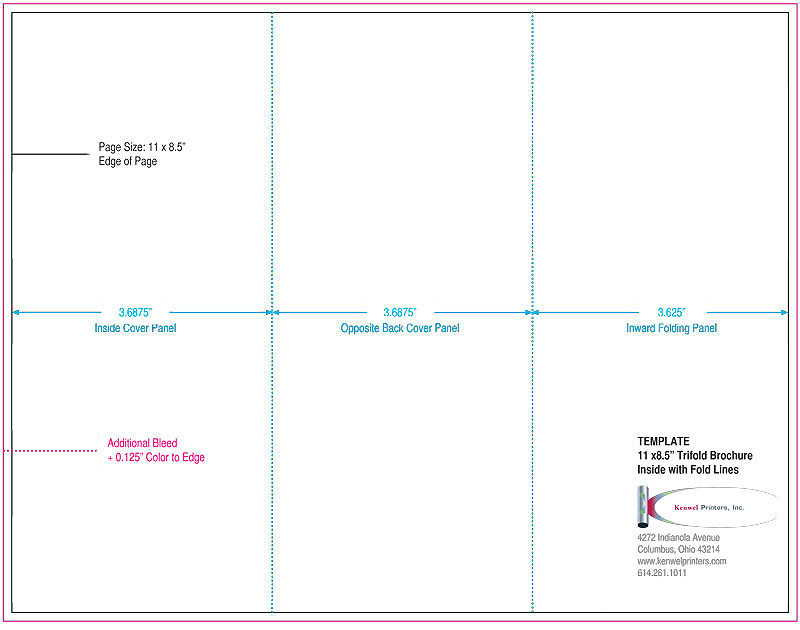 As the prefix implies, a trifold brochure is created by folding the page into three sections along two folds. The most common trouble we face with brochure design is the proper location of the fold lines. One is tempted to think that if three panels are required, the page should be equally divided into thirds. However, this is not the case. Folding the page requires that one panel — the one that folds in, typically from the right side— be slightly narrower than the others, so that the cover panel folds neatly atop it from the left. On the outside layout: This is the page that will contain your brochure cover. Panel widths (left to right) are 3.625″, 3.6875″, and 3.6875″. This means on an 11″ landscape page, the first of two fold lines (left to right) will be placed at 3.625″ and the second at 7.3125″. Select Example A to view the template’s outside dimensions. EXAMPLE A. Select to View a Larger Image. On the inside layout: The reverse (or mirror) measurements are used with panel widths (left to right) of 3.6875″, 3.6875″, and 3.625″. This means that on an 11″ landscape page, the first of two fold lines (left to right) will be placed at 3.6875″ and the second at 7.375″. The panel that folds in from the right is the narrowest panel at 3.625″. Select Example B to view the template’s inside dimensions. EXAMPLE B. Select to View a Larger Image.